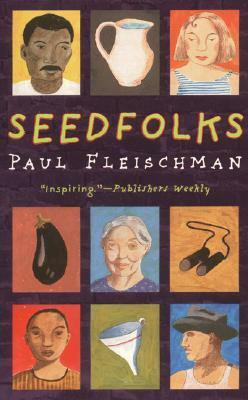 Newbery Medal-winning Seedfolks from Paul Fleischman tells thirteen stories from diverse perspectives—young and old, immigrant and native, haunted and hopeful. A fractured neighborhood unites with just a few seeds, turning a drab empty lot in Cleveland into beautiful green garden. Seedfolks has been chosen as a state- and city-wide read in communities across the country for its inspiring message of unity. Kim begins the garden, planting a few lima beans to connect with her father who died when she was a baby in Vietnam. Then Tío Juan, a farmer from Guatemala, gains purpose when he teaches the neighborhood children how to plant. Soon curious neighbors join in and together they grow a beautiful garden. With each bean sprout and cucumber blossom the residents of Gibs Street find hope and meaning in their little green paradise. As the Christian Science Monitor noted, "The size of this slim volume belies the profound message of hope it contains." I was introduced to this book by my town's community theater. They had come to our school to discuss an upcoming presentation of this novel as a one-woman play. At first, I was rather put off. I didn't think that the premise of the novel sounded interesting and I knew that I had to read it because our school was going to go see the play, but that didn't mean I was going to enjoy it. I was wrong. I ADORED this book and devoured it in one night. I simply could not put the darn thing down! I actually finished it the same night that I finished The Guttersnipes. And now that I have my seventh grade homeroom reading it, they are really getting into it as well. In fact, one student got so caught up in it, he read straight past what was assigned and wanted to keep going. My favorite thing about this book is the message. I have never seen another piece that brings so many people together despite any generational or cultural boundaries. I loved the image of a garden growing amidst the trash and a community of a wide variety of individuals coming together to beautify the place and to grow it into something that benefits an entire community. Fleischman showed true skill by writing each chapter from a different character's point of view while telling a single cohesive story the entire way through. Not only does this allow for absolutely stunning character development, it allows the plot to be more complex. There are very few books that I can't give any constructive criticism or negative feedback. This is one of those rare occurrences.